With 99% of the votes counted, Foreign Minister Tzipi Livni’s Kadima Party leads with 28 of the 120 Knesset’s seat (Israeli parliament), with Binyamin Netanyahu’s Likud Party following closely behind with 27 seats. Both held victory parties, but without a majority neither can govern. The hard-line parties won a majority of the votes, which means Netanyahu has a better chance of forming a coalition which needs 61 seats to govern. Despite the highly contested race between Livni and Netanyahu, the unexpected Yisrael Beiteinu Leader Avigdor Lieberman, has taken the spotlight and is now the third-largest force in the parliament. The stage is now set for what is expected to be weeks of coalition negotiations. Whatever government is forged, it will be up to the Israeli President Shimon Peres to decide whether Livni or Netanyahu should form the new government. Political paralysis is now likely to dampen the peace talks with the Palestinians and will possibly be a thorn in the side of President Barack Obama, who has said that the Middle East peace process will be a priority in his administration. 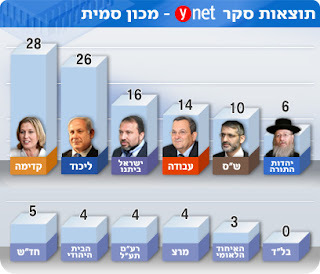 The final word, without Lieberman, Tzipi Livni has no government.